First and foremost, Budapest is pronounced Buda-pesht in Hungarian so make sure you pronounce it right as locals hate it when tourists pronounce it Buda-pest [according to the tour guide])! The easiest way to get to Budapest is by bus/train from major capital cities such as Prague, Vienna and Bratislava. The city is quite small compared to other capital cities in Europe, it will only take you two or three days to visit all the main places. The city is divided into two main sides, Buda side (west) and Pest side (east) by the Danube river. Both sides are equally beautiful and you reach the other side easily by 5-10 minutes walk across the Chain bridge (pic below) or many other bridges (like I said, Budapest is a small capital city so most places are within walking distance to each other). There are underground trains but trams are also another popular alternatives as they run through the town centre and all other tourist attractions as well. If you really have no idea where to visit first, I suggest you to try the free-walking tour (they have one in the morning and one in the afternoon) and they normally meet up at the main town centre square in the Pest side. (east) Within these 2-3 hours, you’ll get to see most of the tourist attractions in both sides of the city. A very short, informative and comprehensive tour, perfect for those who have limited amount of time or those who want to have a quick overview of the town. Here is a side-view of this beautiful historical architecture. Just few minutes walk from the basilica is this interesting building where all the masterminded gather! Now we cross the bridge to the Buda side (west) of the city. The first thing I recommend you to visit is this beautiful white church Matthias church.. The colour and design are simply stunning..
this is why it is one of my favourite churches in Europe.. Besides Matthias church is the another big attraction of Budapest..
Just next to the Matthias church the Fisherman’s Bastion is another must-see attraction of Budapest! It provides a nice view of Budapest which you can see the famous Hungarian Parliament on the other side of the river. The view of the bastion itself is also beautifully-designed and simply stunning. Only few minutes walk from the Fisherman’s bastion you’ll enter the area of Buda Castle..
..and from here you get another neat view of the whole Pest side whilst enjoying the warm breeze on this hilltop. If you’re fan of street arts you won’t be disappointed, there are everywhere in Budapest. Did you know that Rubik Cube is invented by a Hungarian sculptor Ernő Rubik? Here is a wall paint of a Rubik Cube..
And this wall painting is my favourite it makes the whole area pops and comes to life. At the town centre there are countless shops which sell local foods, pick any and try! Hungarian foods are not the most healthiest foods on Earth as many of them are deep-fried but you should try once regardless! Frici Papa is one of the most famous local restaurants in Budapest. The food here is really good without those high price-tag. I recommend you to try these deep-fired chicken fillets, they’re out of this world! Oh and don’t forget to order tomato juice which is a great compliment to the meal! 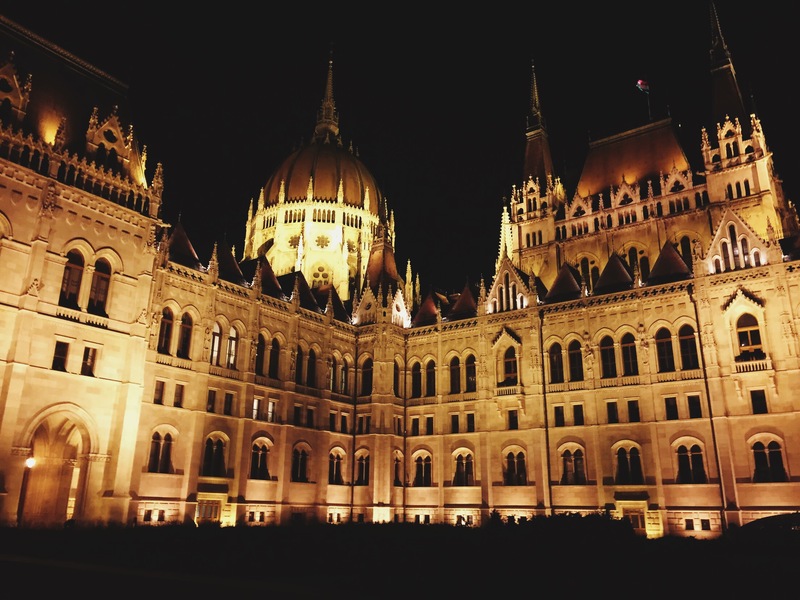 Budapest is also absolutely gorgeous when lights lit up in the evening so make sure you don’t miss this experience. Start of with walking from the city centre. There are many gift shops/stalls around here. Next, walk towards the river to get this night view of the Buda temple and the bridge across the river. Also, did I mention there are many random sculptures all around town..
..as well as many other beautiful artwork like this Olympic rings! Keep walking towards the bridge and walk pass it for another 3-5 minutes..
You’ll reach the famous Hungarian Parliament Building which lids up beautifully at night. Here is the front view of the parliament..
And to get the back side of the parliament simply cross the bridge to another side of the river.. There is no better way to end a day in Budapest than this! 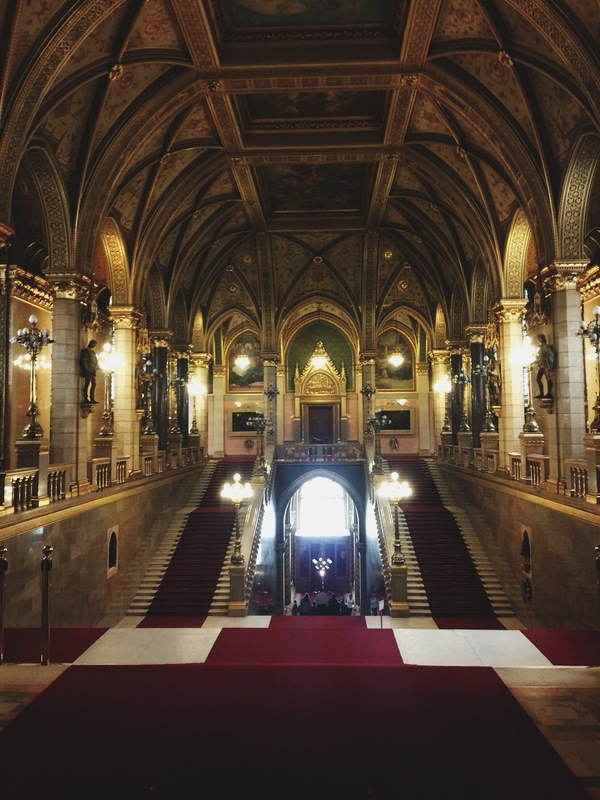 The Hungarian Parliament is named World’s no.1 most beautiful parliament and this is something you can’t miss if you come to Budapest. You have to book a tour to go inside so I recommend doing this online at least one day beforehand. First there is this selfie spot at the cafe shop mirror just next to the parliament..
Next we walk towards the main entrance through this small garden.. I have to mention that once you enter the parliament you can only take photos of the outside view and some of the areas inside due to security and confidentiality concerns. This will be the first view you’ll see from the inside.. This is the main staircase inside the central wing of the parliament.. Even the model of the parliament is flawless..
these models are everywhere in the parliament building. After you’ve walked all day long it’s time to treat yourself with thermal bath. Thermal bath is very famous in Budapest and is something not-to-be-missed! The two main ones in Budapest is the Széchenyi Bath (Pest side) and the Gellért Bath (Buda side), both of them are equally perfect but I chose Széchenyi because it’s closer to my hotel. This is the first and the main thermal bath pool once you enter. Don’t worry of the cold water as the pool is heated and it’s also fitted with jacuzzi massage. There is also this stunning 50m long professional swimming pool. A city filled with interesting history, art, architectures , culture and people Budapest has become one of my most favourite destinations in Eastern Europe! I will definitely go back and visit the beautiful Budapest again!